Tuna dip recipe - as promised! Sorry, no picture this time! The dip didn't hang around long enough for a photo shoot, but here is the recipe anyway. I reckon this would be delicious spread on toast too! 1. Place the tuna in a food processo. Add the remaining ingredients and process until smooth. 2. Transfer to a serving bowl and chill until you are ready to eat it! I can't believe its been this long since I was here last. Life certainly has kept me on the fly! It's a rainy and cold June day today, and as usual in this kind of weather, I have the cooking bug. I've made the simplest Lemon Curd, an easy peasy Tuna Dip, and I'm going to try my hand later at Jalapeno Cornbread - just to appease the hungry Cajun in my home! 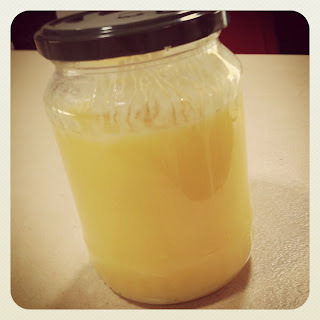 I cannot wait until this Lemon Curd has cooled down and I can spread it on toast for afternoon tea! Lemon Curd.... just waiting to be eaten! 1. Place the butter, sugar, lemon zest and juice in a medium sized bowl over a pan of gently simmering water over low-medium heat. Stir continuously until the sugar has dissolved and the butter has melted. 2. Beat the eggs then slowly add them to the hot lemon mixture, stirring continuously over a low heat until the mixture thickens. Do not allow it to boil or it will curdle. 3. When it is thick enough to coat the back of a spoon, the lemon curd is ready. Pour into a warm sterilised jar and seal. It will store in the fridge for up to 2 weeks (if it lasts that long!). I'll be back later to share the Tuna Dip recipe with you! This time exactly one year ago, I was cruising at about 40,000 feet above the Pacific Ocean on my way to the USA. My mind and my pulse both racing as if in competition with each other. What on earth was I doing? Had I gone insane, and just didn't realise it? This was the stuff of soap operas and trashy romance novels. Not something an intelligent, married, mother of three would do. But there I was - watching movies, listening to music and telling myself over and over again, that this was something I just had to do. And it really was. I'd never been so sure of anything else, and I knew deep in my bones that it was what I needed to do. I knew that if I didn't, I could quite possibly be missing out on an opportunity that would never come again. Of course, the logical part of my brain was telling me that it could also be the biggest mistake I would ever make, and the results of that mistake would have repercussions that, at that time, I really couldn't fathom. These two forces, my head and my heart, fought it out so hard during that plane ride, and I was none the wiser when I landed in New Orleans. I thought I knew what I was doing, but there was always those little 'what if's' that kept sticking their noses in! I felt him before I saw him. His arms grabbed me and practically squeezed the life out of me! I was too busy answering a text message, and didn't see him coming. Scared me witless! But then he kissed me. And that was it. I knew I'd made the right decision. I knew that the risk had been worth it, and I knew that there was no turning back. We've spent 10 weeks apart since that day, one year ago. But we don't intend to spend another minute without each other, ever again. My friend Roxy shared this with me a couple of weeks ago via Facebook, but I only got around to making it yesterday. 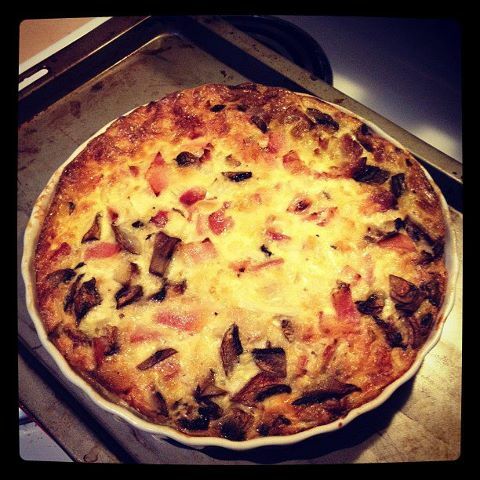 And like I do most recipes, I gave it a little twist of my own. Instead of corn kernels I added finely chopped mushrooms, and I didn't have parsley, so I added some fresh chives. I guess it's the kind of recipe you can adapt to suit what you like and what you don't like. I was going to have a salad and some garlic bread with it, but I got kind of lazy and just had bread and butter instead. Oh well, my intentions were good! Whisk flour and milk in bow, l then add all remaining ingredients. Grease a shallow quiche dish, pour in mixture, and cook on 150 degrees celsius for about an hour, or until brown on top and set in the middle. I liked it hot, but David preferred it cold the next day. Either way, it was delicious! Thanks Roxy!! Dining room project - COMPLETE! There's really nothing like acting on a bit of 'spur of the moment' inspiration, is there? On Friday we had a light bulb moment regarding our tired looking dining room. My favourite magazine is Real Living, and one page in the latest edition got us thinking. Before we changed our minds we were straight up to Masters to get what we needed. Red was to be the feature colour. Big, bold, sassy red! We also decided that one wall would be a black board - part children's entertainment centre, and part adult reminder centre. It was raining outside (again!) so it was the perfect day to pull out all stops and create something flashy to brighten everything up. We started by cleaning the walls down with sugar soap, and then cut in around the edges with the paint. We then added the blackboard paint on our chosen wall. We had lots of little hands wanting to help, so we had to barricade the area with stools and chairs, although we did let Jai have a turn with the roller. One roll up and down and he was satisfied! It took us two full days to finish the project but it was so much fun watching it all come together. It cost us just a little over $100 to transform the space and we love it to bits. We finished the blackboard off with some faux timber skirting boards, and we re-arranged our family photos on the opposite wall. What do you think of it? As for us, well, we can't stop looking at it. In fact, we may just move the lounge suite in there tonight and watch the wall instead of the TV! Next up (aside from the still on-going garden project! ), is the restoration of a piece kitchen hutch into an awesome shelf. Renovation projects galore in this house! Betty Crocker eat your heart out! My daughter is obsessed with cake decorating. She watches YouTube videos constantly and has taught me what an offset spatula is, what a crumb coating is, and that icing is really called 'frosting'! I swear she has watched this one a hundred times! And she's asked me just as many times if she can make her own. So I indulged her today and we made one. I had to admit defeat when it came to making a princess cake, so I bought a chocolate fudge cake packet mix, raided the chook pen for eggs and while the rain poured down outside, we baked. Seeing as though she couldn't make a princess, she decided that the cake absolutely had to have chocolate 'frosting', and that it would be covered in pink flowers and butterflies. This is the end result. Frosted and decorated all by my own little pâtissier. Yes, I know there are no flowers and butterflies. Girls are allowed to change their minds, you know! It's our prerogative. And whoever said that having older brothers won't make a tomboy out of a girl is lying! My man and I just spent a gorgeous weekend at Binna Burra. It was the weekend we've been craving for a long time, and it was just what the doctor ordered. We arrived late on Friday afternoon, but with still enough light to set up the tent. We felt a bit like hillbillies with our set up - a 15 year old tent, no gas stove, no blow up mattress and our outdoor coffee table from home! But we had everything we needed for two nights, and we were child-free! Binna Burra is a perfect campsite. Lovely clean facilities, including washing machines and dryers if needed, and such a pretty setting in the rainforest. On our first night, our neighbours camp was invaded by a possum right after they'd finished cooking. Cheeky little thing! We slept cosy in our itty-bitty tent and woke up to a brisk morning. We decided to walk to Kweebani Cave, which has been naturally formed by wind and rain over thousands of years. The Yugambeh people used the cave to shelter in during stormy, rainy weather. We met a lovely German couple there, who stopped for a chat and a Tim Tam. It's a great walk and is the perfect for little legs. We plan on taking the kids back there one day soon. The Yugambeh tribe lived on the Gold Coast and it's surrounds, for thousands of years and their ancestors are still here today. I know some of them, and it's an honour to be able to walk a path that has been trodden by so many before us. We chilled out at the lodge for a little bit after our walk, and on the way back to the camp site, David spotted a koala in a gum tree. Can you believe it's the first time I've ever seen a koala in the wild? I think I was more excited than my resident tourist! For dinner, we had steak cooked over the camp fire coals. While we watched our neighbours heat their canned dinners on propane burners, we feasted on rump and vegies and it was delicious! It took longer to prepare than to eat, but it was worth every mouthful. Aside from the crows waking us at 5am, we slept soundly again, soothed by the sound of the wind whooshing through the tops of the trees. There's something really special about sleeping outside, even if covered by canvas. It's soothing to listen to the sounds Mother Nature provides, and the peace of being under a rainforest canopy is like none other. It's medicine for the soul, and it's something we plan on doing over and over again. We may even splurge and get ourselves a new tent one of these days. For now though, we are more than content with what we have. I'm an everyday mum, with some not-so-everyday ideas. Things flit and fly around in my mind all day long - sometimes coming in as an idea, sometimes as a poem, other times as pictures. 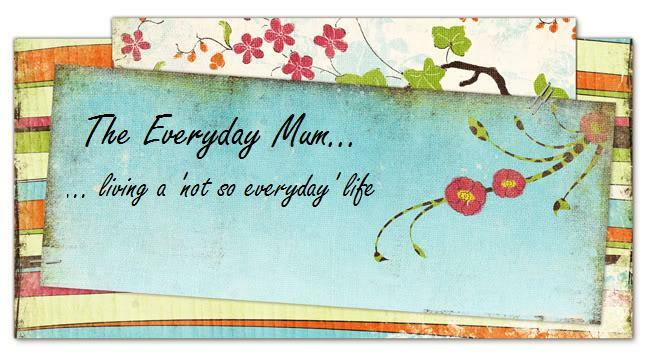 The Everyday Mum is my creative outflow. I hope you enjoy it!